The theme for this episode is 'Escaping Race' and I was laughing at the first scene where the Running Man were sent to the jail because of the hilarious crimes! Yoo Jae Suk is guilty for his uncontrollable urge to dance, Jong kook for coaching everyone, Ji Suk Jin for being weak, Ji Hyo for being pretty and I agree with that. I felt touched when Gary said that Ji Hyo stole his heart. That is Kang Gary cuteness! Kwang Soo is accused of various crimes such as betrayal and his theatrical act. Finally, we were introduced to the guests Gong Yoo who is accused of setting fire in women heart and Park Hee Soon whose crime is being charismatic. They were here to promote their latest movie - Escape. Both of them were visibly embarrassed with their 'crimes!' PD Jo instructed them to find a way to unlock their prison cell. Wow! The first mission was tossed out fast and we saw how the guys literally put their heads together to figure out a way to get out. Kudos to our detective Sherlock Holmes Kim Jong Kook for being the first to find the clues to unlock the prison cell! The clues were found in their prison clothes. I love it that Jong Kook finally show his skills after so long. Kim Jong Kook have both the brain and brawn. Ok, I admit that I am in fangirl mode right now. The group were divided into three teams namely; Blue team: Jong Kook, HaHa and Hee Soon, Orange team: Yoo Jae Suk, Gong Yoo and Kwang Soo, Green team: Ji Hyo, Gary and Ji Suk Jin. Soon they realized that they have to fight hard for their freedom. PD Jo stated that each mission, the team that wins will have a chance to vote a person out for their final mission. Jong Kook whines that everyone will write his names. After the introduction to today's game, they set off to a swimming pool and over there, they will compete against each other at the metal bar. Gong Yoo arrived at the pool late, therefore the orange team will compete with the green team first. The mat-hyungs started to compete first and I expected Ji Suk Jin to fall into the pool. However, I did not expect Ji Suk Jin to pull Jae Suk shorts and fall into the pool! I was snorting out loud while trying hard to control my laughter! After that, Kwang Soo tried to use a towel to wrap around Jae Suk but he accidentally slip and fall! Replay again. Hahaha! Is that a body gag? Gong Yoo and ace Ji Hyo face off at the next round. It was nice to see Gong Yoo gently pulled Ji Hyo down into the pool. That was not the case when it comes to Gary and it was an intense moment with the man to man fight. After some struggles, both of them fall into the pool! The orange team was left with Kwang Soo so they won the first round. The next round against the Blue team was not an easy feat either since they have Spartakook in their team. Haha gave Jae Suk a few kicks before the latter grab him at the waist and pull him down with all his strength. Hee-Soon was up next and he proved that he cannot do anything when he could not hold on anymore and fall into the water. Finally, Spartakook took over and quickly climbed up the bar. On the other hand, Kwang Soo hands slip from the bar and he fall into the pool. Jae Suk gave a priceless expression as he asked," That was it?" A highly anticipated moment arrived when the strongest rivals Gong Yoo and Jong Kook were about to compete at the bar. As a big fan of Kookie, I was cheering for him and indeed it seems like Jong Kook had the upper hand initially when Gong Yoo was hanging upside down at the bar. Jong kook tried to tickle Gong Yoo while he twist and turn around. Suddenly, Gong Yoo grabbed Jong Kook and turned him over! Oh no! It looks like Jong Kook will fall into the pool but he managed to shove Gong Yoo hands away and emerged as the winner! Hooray! The camera zoomed into Monday couple astonished expressions. The blue team have two papers to fill up the name of the person they wanted to vote. While the orange team who came in second have one paper each to cast their vote. Haha started a group chat and rallies everyone to vote for one person. Kwang Soo immediately open another chat and deliberately leave Jong Kook out. That was until Hee Soon asked out loud if they received the private message and handed the phone to Jong Kook. As an act of revenge, Jong Kook opened another chat and publicly warn Kwang Soo. That gave Kwang Soo a shock and he was flustered by that threat. Their next destination is at the beach and they will be tested on their escape skills. Each team only requires a person to escape and find the key to unlock the bun steamer to win. Please turn on the music and dance! Hee Soon who earns the nickname - Speedy Hee Soon scrambled out of the tiny opening twice! At least, now he knows his potential in escaping. However, luck wasn't on his side as he chose the wrong keys. Finally, Gong Yoo secured a win for his team as the rest looked at them enjoying their treat. That scene was simply adorable. All is not lost, since we were left with the two teams competing against each other. Next, they were dancing to Turbo music - Love is... I never get sick of the Jong Kook and Haha combination. Ji Hyo was cheering for them and the orange team who won the race were seen dancing to the music too. Music stopped and the first person who leaped out of the opening was - Kim Jong Kook! The exciting moment arrived as he chose the key and attempted to unlock the bun steamer. Bravo! He did it and his team gets to enjoy their bun. Song Ji Hyo grab a big bite on Jong Kook bun to satisfy her hunger. Their next mission is to spin Hula hoop? Jong Kook stated that he is bad in spinning hula Hoop. Hee Soon admitted that he is bad in Hula hoop too. The camera zoomed in as he attempted to spin the hula hoop on his waist, indeed he was bad in that. Not to worry, since their next mission is to spin the hula hoop on their arm. Each team will pick an item from the lists and each team member have to bite that particular food which they picked within the time frame, while the rival team member will spin the hula hoop as a distraction. Jong Kook was the first to spin the hula hoop. THAT was fast and scary! Kwang Soo attempted to bite the celery but he was beaten by the celery instead! Next, Hee Soon turn to spin the hula hoop and he soon had difficulties in spinning it. At one point, the hula hoop even spin out from his arm! Someone please take the hula hoop away in case he hurt himself or other people. Susequently, he managed to spin the hula hoop steadily after a few failed attempts. Eventually, it was Kwang Soo turn to spin the hula hoop at Jong Kook. Time for some revenge isn't it? Kwang Soo spin the hula hoop particularly fast and Jong Kook bite Kwang Soo hand instead. Ouch! Talking about a tiger attacking a giraffe! Anyway, the green team won this competition thanks to Gong Yoo who was gentle with them. Finally, green team gets to cast their votes too. At the car, Hee Soon mentioned that nobody will write Ji Hyo name. Hmm...maybe Ji Suk Jin will write her name? Anyway, the most number of votes right now were Jong Kook and Kwang Soo. Back to the group chat again as Haha and Kwang Soo exchanges messages. Jae Suk spam the messages during the chat and interrupted their conversation. Ha. We arrived at a building for the last mission - Name tag ripping game. Jong kook mentioned that this is a game and there is no hard feelings. The rule of the game was to eliminate the person who receive the most vote and the only way to save themselves is to find the whistle hidden in this building. The person who is supposed to be eliminated need to blow the whistle for him or her to be place at the last. Everyone found a place to hide in the building as they await for the name to be announce. Surprisingly, it was Kwang Soo (11votes) who will be eliminated first. Just like everyone, I expected Jong Kook to be called out first. Kwang Soo hid behind a cardboard. Unfortunately, he did not notice the whistle that was placed in the same room where he was hiding. Ji Hyo found Kwang Soo first and the rest followed and surrounded him. Lee Kwang Soo out! Off to the prison and Kwang Soo complained that the camera was not even set up yet. No prizes to guess the next target was - "Kim Jong Kook!" The problem is he was nowhere in sight. 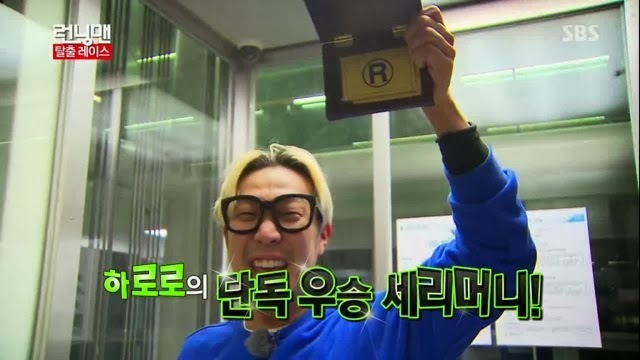 Jae Suk found the whistle hidden on the floor and attempted to cover it to prevent anyone from finding. Soon, they found Jong Kook and Hee Soon had the honor of tearing Spartakook name tag. Gary shocked expression when he heard his name as the next target was simply priceless! I bet he did not expect his name to be called out so soon. After Gary elimination, it was down to Yoo Jae Suk. Gong Yoo was wondering will his name be called out next, that was when he discovered Yoo Jae Suk and gave chased. Yoo Jae suk was ousted by Gong Yoo and the next targets was none other than Haha and himself. Hee Soon almost eliminate Gong Yoo when they heard a loud whistling sound. Turned out that Haha found the whistle and blew it just in time to save Gong Yoo. Haha became the last and Gong Yoo was placed just before Haha. At the prison, the foursome have their own conversation. Jae Suk confessed that he found a whistle but cover it to prevent others from finding it. Ji Suk Jin and Hee Soon were the next targets. It was funny that they both hide at their respective places and wished the other party can find the whistle and save them from elimination. That was not the case as they were soon eliminated. After Ji Hyo elimination, Haha ambushed Gong Yoo and eliminated him. Gong Yoo said that he intend to look cool in the variety show. Haha responded, "That is variety land!" The king of escape goes to - 'Haha!' He proudly showed off his gold prize at the prison cell and walked off! In closing, Yoo Jae Suk praised Hee Soon for being the first guest to earned the nickname - Speedy Hee Soon and Gong Yoo mentioned that he will prepare himself to appear in Running Man again. Yes, please come back again! In my opinion, this episode was one of the best in the recent episodes of Running Man. There was a mixture of fun games, cute interactions, exciting actions and adorable guests. I love the part where Ji Suk Jin pulled Jae Suk shorts and Kwang Soo accidentally fall into the water. Honestly, Kwang Soo is the funniest when he is not trying hard to be funny. I know he was given a character to act on but he need to control his tendencies to scream and most of the time he overdid his drama. The man to man fight between Gong Yoo, Gary and Jong Kook at the pool game were exiting. Hee Soon was adorable and hilarious in this episode too. It was sad that Kim Jong Kook knew that the others will definitely write his name on the paper to vote for his elimination. Nonetheless, he stated that this is just a game and there should be no hard feelings. Kim Jong kook used a lot of strength and energy for all the missions and will win most of the games but it was pointless if he did not win the final race. In this name tag tearing game, it was a disadvantageous situation for the people who were to be eliminated first since it was difficult to find a such a tiny whistle in such a big building. Yes, like what Haha said to Gong Yoo, " that is variety land!" Hopefully, Spartakook will win an individual race soon. Some people complained that the green team did not get much screen time. After all, they did not have a guest to cater to and these three were mostly not very proactive. Monday couple depends a lot on each other chemistry and Ji Suk Jin character is a weak and comical hyung. Gary is always low profile so he was shocked to hear his name being announced so fast at the name tag elimination game. Actually, Gary and Yoo Jae Suk are strong players in Running Man too. Ji Hyo was among the last to be eliminate but to be fair it was a men game and the guys being kind to the ladies will not vote for her to be eliminated. However, it will be good if the editor did not skip Ji Suk Jin and Song Ji Hyo elimination scene and show us how they were eliminated. In the end, I am glad that the editor eventually did not show the scene where Kwang Soo bite Jong Kook toes while hanging on the metal bar although i saw the picture.